The recent attacks on two Ahmadi mosques in Lahore demonstrate the urgent need to strengthen the rights of Pakistani minorities. Pakistan is not a country inhabited by Muslims only, or even Sunni Muslims. This is represented by the green and white of the Pakistani flag, a fact often taken for granted. The three quarter green represents the majority Muslim population, while the one quarter white represents non-Muslim minorities. Once again, the fragile peace process between India and Pakistan has commenced. It is too early to say whether it will lead to an amicable settlement of seemingly intractable issues. What is clear is that the peoples of the two countries want peace, security and progress. The elites, which agreed on the messy Partition and raised nation-states and huge militaries, have surely flourished at the expense of people. A causal look at India’s poverty and Pakistan’s social indicators proves this point. As a confidence building measure, a group of Pakistani journalists visited Delhi, Mumbai and Bangalore to meet their counterparts, think tanks and selected top-level officials. This was a timely and fruitful visit and reminded us that there is a formidable peace constituency in India. After the Indian home minister it is the turn of the Indian foreign minister to visit Islamabad from today for a three-day tour. Regardless of the outcome, sensible neighbours must continue to talk. Evidently, the Mumbai terror attacks were the greatest stumbling block in resuming dialogue. Discussions at Sharm el Sheikh were a major breakthrough. Dr Manmohan Singh overcame tough public opinion after the joint declaration. This year’s dialogue at the Saarc Summit in Bhutan catalysed the peace process. After the 18th amendment to the Pakistani Constitution, the Indian side has noted the power shift within Pakistan as it strives to reclaim the democratic path. 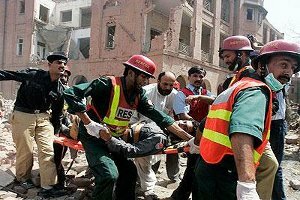 35 dead and 175 injured – the numbers may increase..
As if the recent acts of violence and an atmosphere of fear was not enough, the butchers have attacked Lahore’s oldest and grandest shrine – also known as Data Saheb. Thursday night is the time when thousands visit this shrine to pray and offer their respects to Hazrat Usman Hajwery, a Sufi who has been known as the protector of the city and the generous guide who is believed to have blessed countless generations. This is a barbaric attack and should serve as a wake up call. Data Saheb’s shrine is not just another crowded place – it represents a millenia of tolerant Sufi Islam which is directly under attack by the puritans.Last year, there were threats and the government had closed the place for a day or two. This time the worst of nightmares has come true. How long will we be mere spectators and see our great city blown to bits – culturally and physically. This is time for hard, concrete action and a major crackdown on all terrorist outfits that are operating in the country especially the Punjab wit impunity. Do not mistake my silence..
Do not mistake my silence.. I am an Ahmadhi but I am not a coward!